The news that at last a film will be made about the stand taken by Irish troops at Jadotville while serving with the UN force in the Congo has been welcomed across the board by the Irish defence family. For many of the troops fighting at Jadotville the journey to Africa had started on the square in Athlone’s Custume Barracks, coming as the majority did from the 6th Infantry Battalion. In September 1961 the rebel-held province of Katanga was located in the very bowels of the Congo. It was in this province that 157 men from A Company of the Irish 35th Battalion were deployed to a mining town called Jadotville to protect the largely white Belgian inhabitants from massacre by marauding tribal groups. But within a very short space of time the troops were to find the settlers had turned on them and were attacking the Irish positions with an overwhelming mercenary-led rebel force. The Irish positions were attacked while the main body of troops were attending mass parade with their Chaplain, Fr Tommy Fagan. As the native troops and their mercenary officers swiftly advanced sprawled across their jeeps like extras out of Kelly’s Heroes they felt invincible. Why wouldn’t they when information had been passed to them by a Belgian businessman about the morning’s mass parade. The Irish wouldn’t know what hit them. However, they didn’t bank on Offaly man, Sgt John Monahan. In his singlet, having just finished shaving and with his towel still draped around his shoulders, Monahan vaulted a couple of trenches to get to the nearest Vickers machine gun. With this belt-fed weapon he started to lay down accurate bursts of machine gun fire which broke up the Katangan attack and caused the jeeps now to career wildly. This was to be the start of a week-long siege of the Irish positions by an enemy force that at its peak numbered 3000. Most of the men were lucky, their commanding officer, 42 year-old Kerryman, Commandant Pat Quinlan, had ordered them to dig trenches on their arrival and this effort was now saving lives. However, Platoon Sergeant Walter Hegarty wasn’t in his trench the morning the mortars fell. Ever mindful to his men’s welfare, the 29 year-old Galwegian was returning to the trench lines with fresh water. “I heard the plop of the rounds as I was coming across open ground. I knew I was out of range of their machine guns, but not the mortars. As the rounds flew through the air I had a couple of seconds to drop the water and jump into a small depression in the ground. “I remember how clear and sharp the colour of the grass was as the rounds came in”. Crump! Seconds later Hegarty could feel the burning shrapnel lacerate his flesh. “I could feel the blood running down my back and legs, but I wasn’t in pain, just a daze and a voice in the back of my mind reminding me that the next round was just seconds away”. Hegarty was on his feet and sprinted like an Olympian to the nearest trench, tumbling headlong in on his fellow troops. Though later brought back to the rear for treatment he insisted like other Irish wounded on returning to the action until the end of the battle. This was Ireland’s first significant involvement in the UN’s first large-scale peacekeeping operation in the Congo in the early 60s. Unfortunately the ineptitude of arrogant and naïve UN civilian administrators caused the deaths of many of the international troops sent to keep the peace, including the Irishmen who were killed at Niemba. Such ineptitude and an inability of senior UN officials to follow military advice led to the deployment of troops to Jadotville. However, when the troops arrived they found the settlers to be hostile and sympathetic to the mercenary-led forces of Katanga, a mineral-rich province causing chaos by trying to break away from the newly independent Congo. Similar to the Dutch peacekeepers who turned tail at Srebrenica ten years ago, the small Irish contingent was denied any air or artillery support to aid them against overwhelming odds. But unlike the Dutch, and even though under aerial bombardment from a Fouga jet, the Irish dug in and fought to hold their ground. This they did for nearly a week against a force that outnumbered them 20 to one, with the Irish inflicting 300 casualties on their opponents. Yet for over 40 years both Ireland and the world turned their backs on the Jadotville veterans. While a combined force of Irish, Indian and Swedish troops tried to break through to rescue the men of A Company they were twice beaten back at Lufira bridge, suffering over eight dead and numerous wounded on the second attempt. All the while the UN authorities in New York kept changing mandates on paper but not giving the troops on the ground the equipment and support needed to contain the violence. There were tragic-comic moments too, like when a madcap Norwegian pilot, Bjorne Hovden, was the only one who volunteered to fly helicopter with water supplies to the besieged Irish. Having landed under fire with his aircraft destroyed it turned out the water supplies were unusable having been put in jerrycans that previously stored petrol. This was the only attempt made by the UN to resupply the troops while they fought it out for a week. Young soldiers at the time, men such as Pte John Gorman and Lt Noel Carey have told of their terror of having to hand up their weapons and go into captivity under a force the Irish had inflicted 300 casualties on. Fear of reprisals was huge. The battle created enormous personal strain for the Coy commander, Comdt Quinlan. Not alone was he under the normal pressure of commanding troops in combat, but in the aftermath he had to enter ceasefire negotiations without recourse to accurate information or direction from higher authority. The UN kept telling him jets would be sent to support him but none came. Such was the strength of the mercenary-led force that they beat back two attempts by Irish and Indian forces to rescue the Jadotville men. After breaking the terms of the ceasefire by moving more troops into the area, the Katangans demanded the surrender of A Company. Comdt Quinlan, knowing his situation was untenable, he no longer had the necessary ammunition to defend his position, decided against the needless slaughter of his men and reluctantly accepted the terms. After all, the mission the men of A Company were sent to carry out never existed. The local settlers were not in need of UN protection and were loyal to the rebel Katangan government. After a tense period in captivity, A Company was released in a prisoner exchange on October 26, 1961. The men slotted back into the Irish battalion and even participated in further action, including the Battle of the Tunnel. Lt Tom Quinlan and Sgt Walter Hegarty went on to win Distinguished Service Medals (DSMs) in these further actions. A Company eventually arrived home to a torchlight procession through the streets of Athlone. Particular affection was shown to Comdt Quinlan for having brought home safely the sons, husbands, sweethearts and friends of so many who had gathered. But then the story was quickly forgotten, some believed the surrender was an embarrassment, some believed personal rivalry was the cause. In any event, though it lay dormant for years, the Jadotville story eventually resurfaced. Veterans of the battle like John Gorman and Liam Donnelly continued to pressure politicians for an enquiry and a public setting straight of the record. Irish people were shocked to learn how the soldiers were deployed to an isolated area by UN authorities against the advice of senior military advisors only to be attacked by the very people they were sent to protect. In 2005 Minister for Defence, Mr Willie O’Dea, publicly lauded the men of A Company and their commanding officer for the stand they made and their devotion to duty.A plaque to this effect now stands in mute testimony outside the dining hall in Custume Barracks. For new generations of Irish soldiers Jadotville has now become a place synonymous with courage and honour…as it was and as it should be. 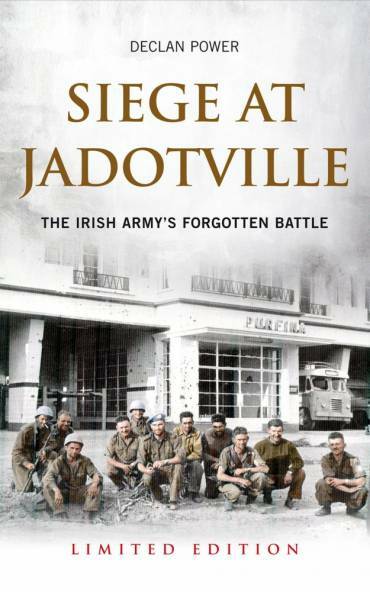 Declan Power wrote ‘Siege at Jadotville’ published by Maverick House in 2005. He is a former soldier and now works as an independent security and defence analyst.